Click here to see the program of gravelling and paving that Bayside City Council has completed in 2014. BCS Inc. opposed this high, dry, sandy entry road being surfaced or kerbed. BCS Inc’s letter of 25 November 2013 responded to the most recent changes in October 2013 that Bayside City Council proposed to its Beaumaris Reserve Master Plan. It welcomed Council’s abandoning its earlier proposals to remove six trees for car parking spaces, and to bitumenize the sandy entry road above, but it opposed the gravelling and kerbing since completed. 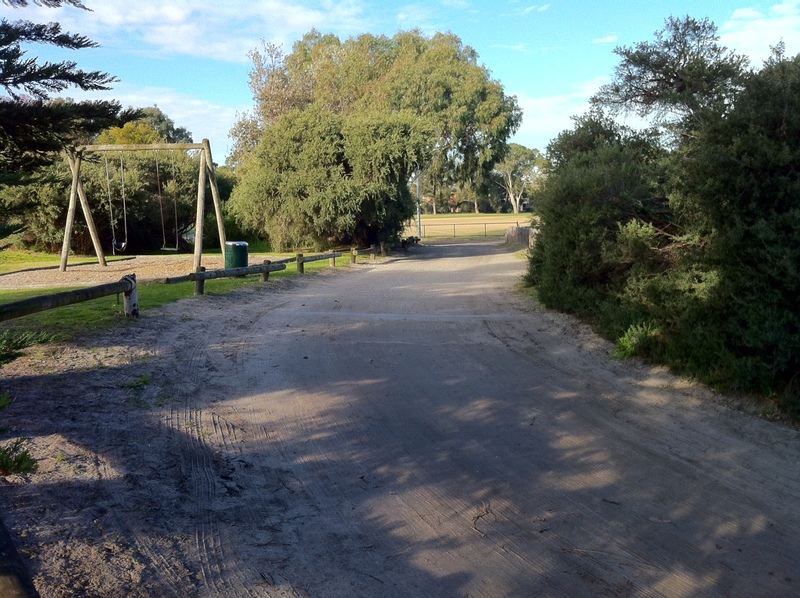 BCS Inc. opposed Council’s most recent proposal to gravel and kerb that entry road, instead asking that the existing dry, sandy surface – one of the few areas left in inland Beaumaris where people can still walk on the natural sandy surface of Beaumaris – be left sandy, as it was, and that its edges not be kerbed. Its edges could be marked by a pine log barrier on the south side, like the existing barrier on the north side in the photo above. BCS Inc. accepts a gravel surface for the actual parking area. BCS Inc. had earlier challenged Council claims of implausibly high traffic use (based on no actual count on site) and unsubstantiated high maintenance costs it is using to support a change to the surface of this pleasant sandy car park entry road. Council should use, instead of the hard kerbs also planned, more low treated pine barriers or square timber posts, as already exist further west. The 2013 Amendment to the 2008 Beaumaris Reserve Master Plan that Bayside City Council considered on 2013-10-29 has withdrawn – but only after opposition by BCS Inc. and residents – its plan to remove 6 trees for car parking, but the amendment still has a general thrust of regimenting and replacing some of the genuinely Beaumaris informal ambience of the Reserve. The most recent plan, submitted for public comment, due by 2 December 2013, appears here. An example was the poor statement in Attachment 3, “traffic island to be in concrete to provide contrasting appearance”. Rather than replacing gravel with Council’s imagined delights of a “contrasting appearance” of concrete and bitumen, BCS Inc. prefers gravel around the traffic island, with the traffic island being low indigenous vegetation protected by timber posts. Council also installed four conspicuous 30 m high lighting poles, over 50% higher than the existing poles.